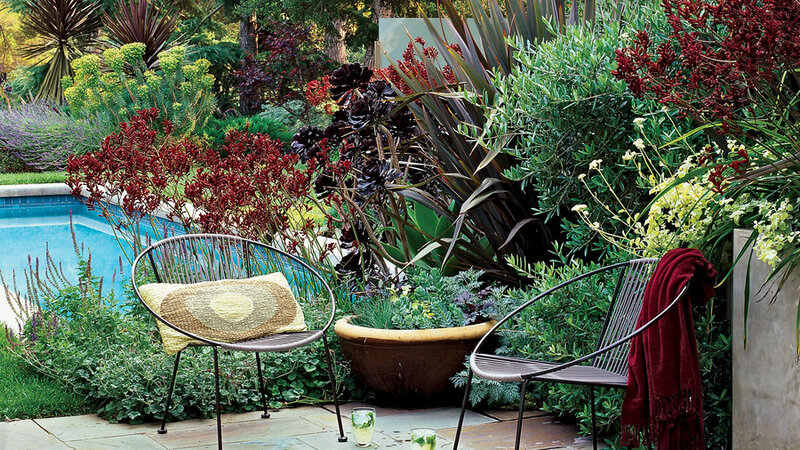 The perfect garden for entertaining can also work for quiet relaxation ― even in a small space. 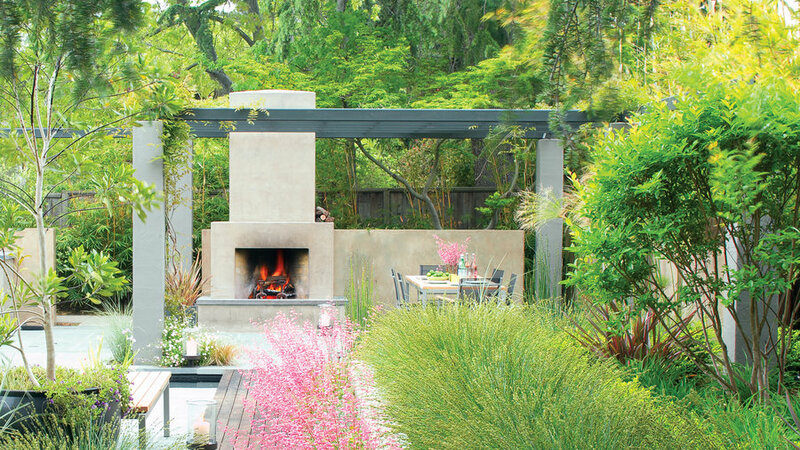 This landscape, created for John and Kathy Ott, accommodates both functions seamlessly. The designers organized the yard into zones that correspond to the home's interior rooms: large patios for group activities, intimate ones for relaxing. A redwood boardwalk, fringed with pink-flowered coral bells, connects a bedroom deck and breakfast nook with the main bluestone patio and dining area on the garden's opposite side. 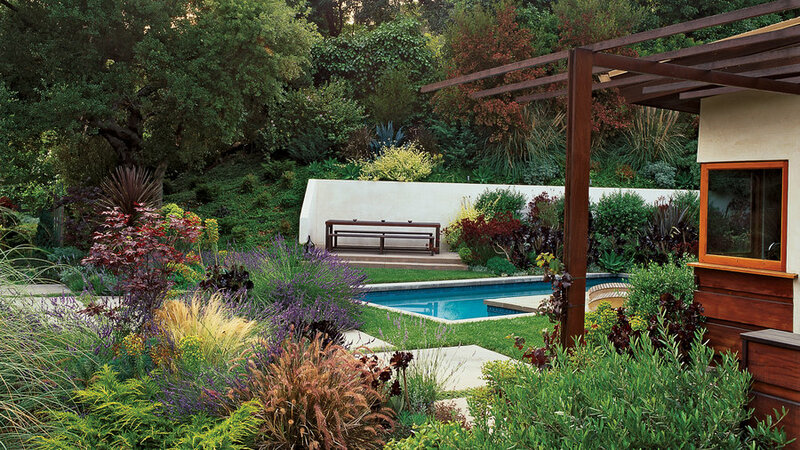 A multilevel property, bare except for a house and two oak trees, was the starting point for this Mediterranean garden. 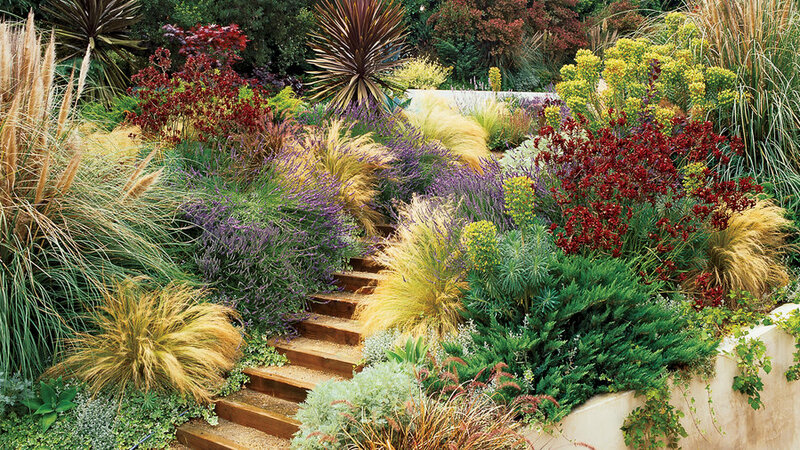 Now a new L-shaped lap pool and elevated dining area are surrounded by an elegant tapestry of tough plants like silvery , chartreuse , bronze , , , red kangaroo paws, ornamental grasses, Phormium 'Dusky Chief', and . Design: Judy Kameon with Michael Kirchmann Jr. and Ivette Soler, , Los Angeles (213/380-3185). 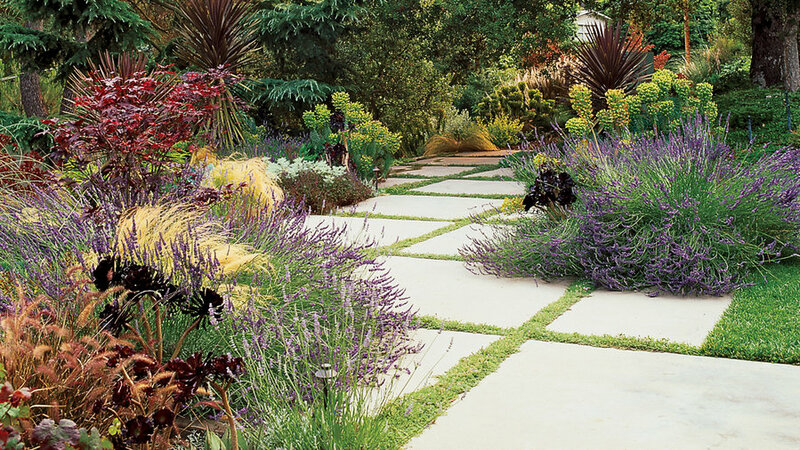 A rich mixture of foliage textures and shapes, along with repeated colors, is key to creating a cohesive, natural-looking landscape. Stairs link the upper and lower gardens. 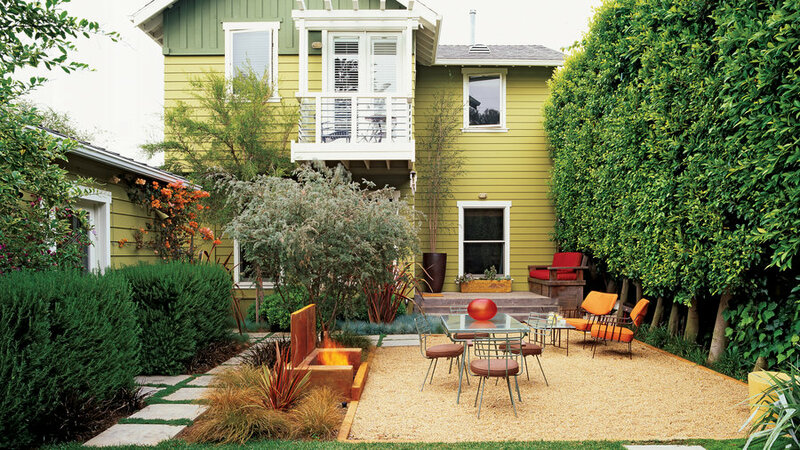 Large glazed pots filled with succulents and other easy plants dress the patios. A colorful landscape might seem far-fetched in Santa Fe's arid hills, where sun, wind, and hungry rabbits challenge even the toughest plants. 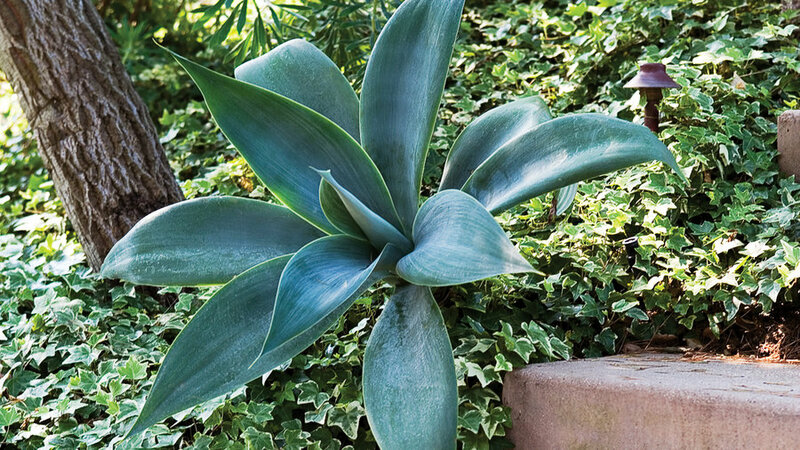 But thanks to a graceful design, smart plant choices, and an innovative water recycling system, a barren space was converted into an exuberant garden. 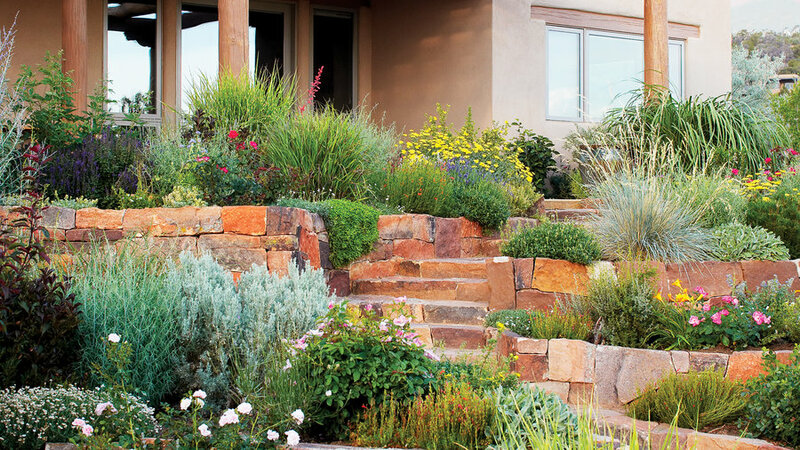 The designers tamed a 6-foot slope with a series of uneven stone terraces, then filled the stairstep planters with rich top soil and aromatic, rabbit-resistant plants such as , , salvias, santolina, shrub roses ( and ), and . 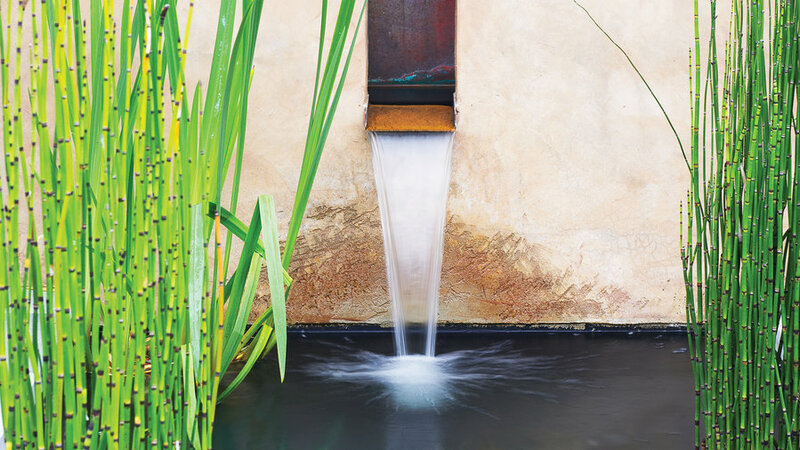 The Pirana water treatment system recycles all household wastewater, using microbes and ultraviolet light, to create a nonpotable source of irrigation water. Design: Monika Hellwegen and Azul Cobb, Carlotta from Paradise, Santa Fe (505/983-1109). The terraced hillside is alive with color, yet it blends with the native landscape beyond. The descending staircase is an invitation to walk in nature. The owners of this property wanted areas for dining, entertaining, and play in a long, narrow backyard overgrown with Ficus nitida trees. The designer's solution was to prune back the ficus hedge to open up the yard to light and create a series of sunny living spaces. Off the kitchen, he modified an existing deck and built a bench into it; in the side yard opposite the deck, he added a barbecue and serving counter. A gravel dining patio, fireplace, and lawn fit neatly into the backyard. Plants in shades of green (a hedge of Westringia 'Morning Light', a Melaleuca incana tree, and a fringe of ) mingle with coppery orange ones (, Carex testacea, and Phormium 'Guardsman'). 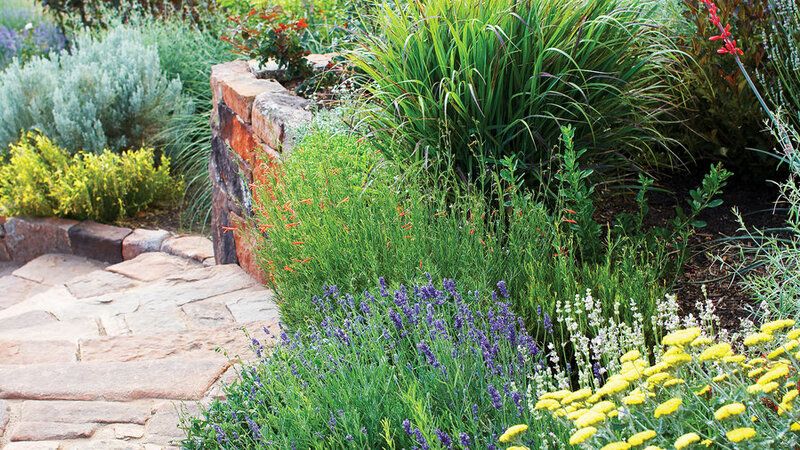 The following garden designers were also winners in Sunset's 2007 Dream Garden Awards contest. • Karla Dakin, K. Dakin Design, Louisville (303/604-2988). • Jamie Fogle, , Denver (303/623-5186). • Todd R. Cole, , San Francisco (415/252-0111). • Tomi Kobara, Oakland, [email protected] (510/420-1197). • Keeyla Meadows, , Albany (510/559-1026). • Diana Stratton and Brian Columbia, , Healdsburg (707/433-2582). • Jeffrey Gordon Smith, , Baywood Park (805/528-2118). • Jim Verdone, , Jackson, WY (307/733-3062).